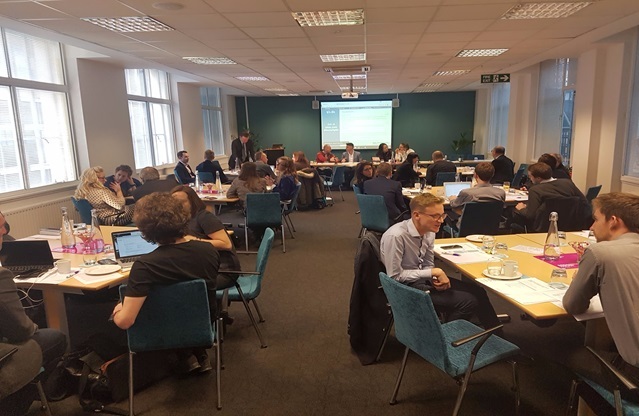 Last week Nesta hosted two small events on digital democracy in London with support from the MacArthur Foundation Research Network on Opening Governance. We invited speakers from four inspiring global initiatives in digital engagement to share lessons and discuss key themes in the future of technology and democracy. With stories and perspectives from Brazil, Iceland, Taiwan, France and the UK, here’s a summary of what we learned. Given a political context of surging populism across the globe, there was a deep concern in the room that digital tools risk amplifying ideological or inflammatory sentiments within society. In response to this we heard about tool-based innovations for debate, like Pol.is or Your Priorities, that are specifically designed to incentivise more broadly appealing and positive forms of opinion sharing online. Cap Collectif’s tool breaks all topics into their ‘problems’, ‘causes’ and ‘solutions’, making debates more focused and easier to navigate. But there was also a clear sense that better online conversations require much more than reliance on the tools. Well designed engagement exercises involve careful planning, multiple stages for interaction and active moderation. One interesting approach was described by Audrey Tang, Taiwan’s Digital Minister and creator of the participatory policymaking process known as vTaiwan. She talked us through her method for bringing people out of the filter bubble and into large, multi-stakeholder deliberations that encourage more careful and reasoned arguments. 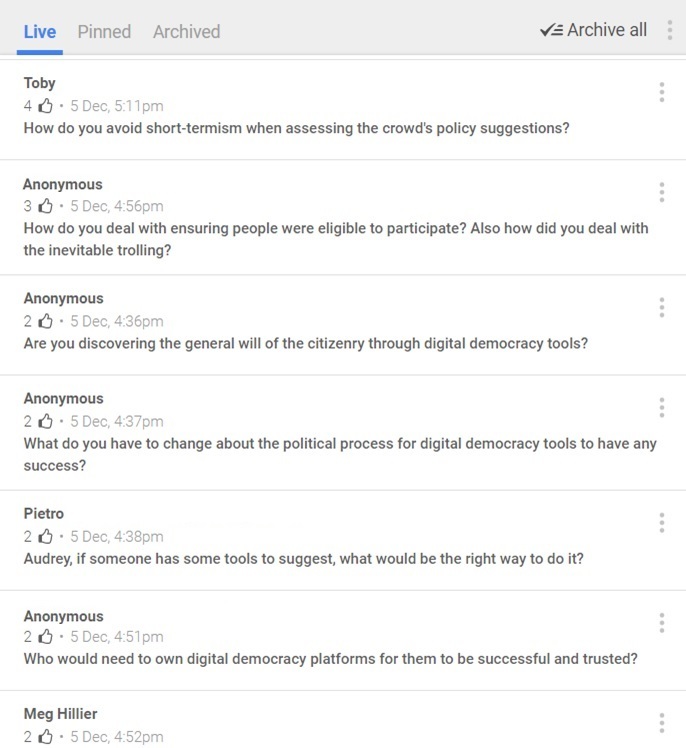 Instead of simply opening an online space and asking for unstructured comments, vTaiwan begins with several weeks designated to nothing but agreeing on definitions, collective sharing of the facts and compiling evidence related to the topic (with validity of evidence continuously confirmed and updated by a small group of facilitators). Representation was an important concern for the audience, and here most of the speakers confirmed the hard truth that, for the moment, purely web-based forms of participation are biased towards the more educated, and those with more time on their hands (usually older people). At this point it’s worth remembering that the purpose of public engagement isn’t always democratic legitimacy: sometimes it’s ok to focus on quality over quantity. You might be looking to use the crowd to arrive at higher quality decisions on a given topic, in which case you’ll be better off targeting a specific audience rather than aiming to engage a fully representative sample of the population. Parlement et Citoyens, for instance, reach out to specific communities or stakeholders of a proposed law or regulation. This might be people with a particular occupation (i.e. teachers or nurses), public or private organisations, or perhaps a group of people with a set of technical expertise. Nicolas Patte from Parlement et Citoyens called this prioritising ‘representation of the arguments’ rather than representation of the population, though of course it’s still important to reflect on who participated and why. What, then, of the promise that digital democracy will be a catalyst for building more widespread involvement, efficacy and trust in politics? All in all, tech enthusiasts need to retain a degree of modesty here. One speaker mentioned that web-based methods should only be used where there is a reasonable assumption that the key stakeholders have access to the internet – for example, it will be better to engage widely on topics related to the digital economy or internet rights rather than on welfare policy (at least for now). If you can’t guarantee that your stakeholders will be ‘netizens’, then resources should be set aside for proper offline methods of outreach and engagement (see Paris’s participatory budgeting process). This shouldn’t be fuel for the naysayers. There are hundreds of opportunities where better use of digital tools would still involve more people than the mechanisms already in place. What’s more: ### 3. While digital is not a replacement for offline methods of outreach, it can help to improve them Online tools can augment offline work by creating a coherent, transparent and altogether more accessible exercise in public engagement. In another example from Taiwan described by Minister Tang, Taipei City Council held a mixed online-offline consultation with stakeholders about policy for the allocation of social housing. In offline workshops, interactive live-streaming tools were used to engage broader audiences and enrich the physical debate. This is an important addition in situations where people might wish to join the meeting but cannot, say, because of caring responsibilities or distance. At the same time, transcription tools like SayIt were used in real time to record and archive the conversations in a structured and searchable format. The job of the facilitator was to compile and summarise offline and online channels, creating a clear and comprehensive electronic record of all the conversations and decisions made over the course of the process. This is also a method which Barcelona en Comu have employed on a regular basis through the Decidim.Barcelona platform, which clearly summarises consultations according to both offline proposals - in workshops organised across the city - and online proposals made on the site. A big error that can be made with digital engagement is to create a consultation that’s basically a black box. If digital democracy is going to play any role in the reversing widespread distrust in politics then the engagement has to create new, meaningful channels of communication between people and representatives. It goes without saying that it won’t be possible to implement everyone’s ideas, but time and resources should be devoted to showing people that a certain number of suggestions are being processed, considered and that their implementation or rejection is being clearly justified. Gunnar from the Citizens Foundation in Iceland spoke about Better Reykjavik, a website for bottom-up idea generation to improve the city. Partnering with the City Council, Better Reykjavik collects, processes and responds to the top 15 ideas made on the platform every month, communicating each stage of the process to the authors of those ideas by email. In other examples: The Brazilian Chamber of Deputies hires ‘legislative consultants’ who act as communicators but also technical translators between the people who participate online and the complex aspects of law-making in the Chamber. Minister Tang uses Wiselike: a public, interactive approach to receiving questions or suggestions. It reduces the ‘noise’ of a traditional forum by only displaying questions which she has actually answered. This kind of tool might be an easy and simple way to improve interaction and accountability by councillors and representatives across the UK. having the political buy-in or will from a councillor, mayor or minister to give the process meaning in the eyes of the public. collaborating actively with skills and expertise within civil society (e.g. DotEveryone, Notinwestminster) or even mobilising volunteers (e.g. the West Midlands People’s Plan, which was created by Liam Byrne MP and Tom Happold with little more than £100). The story for UK Parliament is rather different. The multi-billion pound restoration of the Palace of Westminster has so far focused mainly on the bricks and mortar. But it could offer so much more, namely a chance to blend the most promising democratic innovations with the best of Parliament’s institutions and traditions. What we need now is a broader debate, involving representatives, about how restoration and renewal can be used to foster a whole new range of participatory experiments that inform and involve the public in the long-term future of parliament. Both Nesta and The Hansard Society have made the case for the ‘decant’ space to become a lab for democratic innovations, at a tiny fraction of the overall budget. There is clear international inspiration in this regard, like the Brazilian Hacker Lab described by our speaker Cirstiano Ferri. His Lab, located within parliament, is a semi-public space for hackathons, user-testing and collaboration among civil society and parliamentary staff. The good news is that parliament has plenty of expertise and is already creating a suite of innovative and useful tools in this area. If you’re interested to hear more about the global case studies mentioned above, keep an eye out for our upcoming report, which dives into each of them in more detail.